Selling Intown Atlanta Real Estate | Selling Your Home! Most of us wish to keep our homes organized. That’s a piece of cake. Yet many individuals have a hard time to maintain their home this way. This is due to the fact that there are some typical actions that can be making it tough for you to remain organized. Here are 5 Organizing Mistakes You Could be Making! Lots of individuals like to sort by shade or group things by their physical similarities. Nevertheless, this could really be making areas such as your closets even a bigger mess. If every one of your shirts are organized by color yet you use specific t-shirts during the week and also other ones on the weekend, this will create you to have to sift with every t shirt you have to find one that is work-appropriate or laid-back enough for the weekend break. Rather, group things by feature. Maintain all your shoes and also garments organized in a way that makes good sense for your lifestyle and also you will have a better chance of staying arranged. Before you organize your kitchen area or bathroom, sort out what you have and ask yourself if each thing is still essential. For instance, if you are reorganizing cabinets in the kitchen, take every item out of the cabinet and also lay it out before you. Examine each thing and also choose if you must keep it, toss it or give it away! Now, you only need to organize the products you have left. Organizing items you do not use is a waste of time and will just add to the clutter you are trying to get rid of. Do you acquire boxes and also baskets with every purpose of getting organized by using them, but they wind up sitting in the garage or your storage unit with a wide variety of unassociated things? Before you invest in storage containers, eliminate anything you don’t really need or use anymore. After that, decide how many and what kind of containers you need, on a list. This way, you buy the right containers for the things you are keeping. It’s easy to transform your shelves into a disposing ground for knick-knacks and also various items you do not have a place for. Actually, the bookshelf should have a really thoughtful design of carefully curated products. Bookshelves are open and also become an eyesore when they’re jammed. Also the books you display on your bookshelf ought to be the best of the best! Those paperbacks you need to keep…they go in one of those containers. If you stay in a condo or a smaller house, make sure you have the right furnishings for the space you have to work with. For example, just because houses commonly have a formal dining room doesn’t mean you HAVE to have a dining room table. This could make a great home office or theater room! imply you have to. If you condo has a breakfast bar, and you don’t entertain much, consider not having ANY dining table. It just depends on your space and your lifestyle. Save room for that special piece that came from family or as some other meaning to you! Looking for even more methods to maintain your residence clutter-free… especially if you are thinking about selling … Give us a call today! We are happy to help you with this process, or give you some resources! Midtown Atlanta is most often referred to as the most walkable neighborhood in all of the Metro Atlanta area. And that certainly is true. 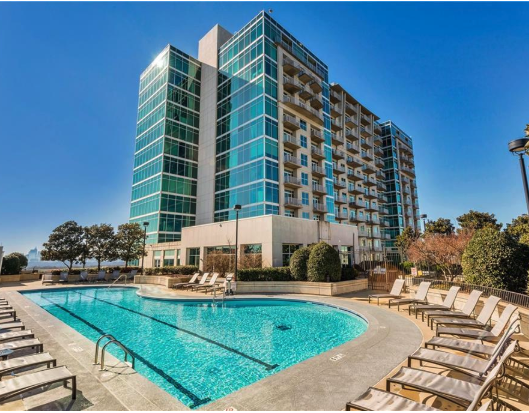 Step out the door of your home or condominium, and lots and lots of restaurants, some shopping, two MARTA transit stations, theater and art museums are all within walking distance. Not to mention the numerous festivals that happen each year in Midtown Atlanta’s “backyard” …. Piedmont Park. A majority of the living options in Midtown Atlanta consist of condominiums and apartments. The area known as Historic Midtown is the only area with single family homes. For the purpose of this report, we tried to outline what is considered Midtown in the MLS, as indicate in the photo on the right. Disclaimer: As we do this “15,000 ft overview” of the Midtown Atlanta market, we attempted to keep the search as indicate in the map above. So places like Ansley Park or Atlantic Station are NOT represented in this report. Single family homes in Midtown Atlanta, are found in what is referred to as Historic Midtown, and area primarily defined by 10th Street, Monroe Drive, North Avenue and Piedmont Avenue. There were 25 homes that sold in 2018, ranging in price from $500,000 to $1,680,000. CLICK HERE to see the report. Midtown Atlanta is best known for condominium living. And the choices range for converted homes with only 4 units to major high-rise buildings with 400 homes! And as you can see in this 2018 Year End Report, there is a range of prices! There were a total of 667 sales in the area for 2018! 78 homes sold between $400,000 and $500,000 or about 12 percent of the market. 160 homes sold between $300,000 and $400,000, about 24 percent of the market. 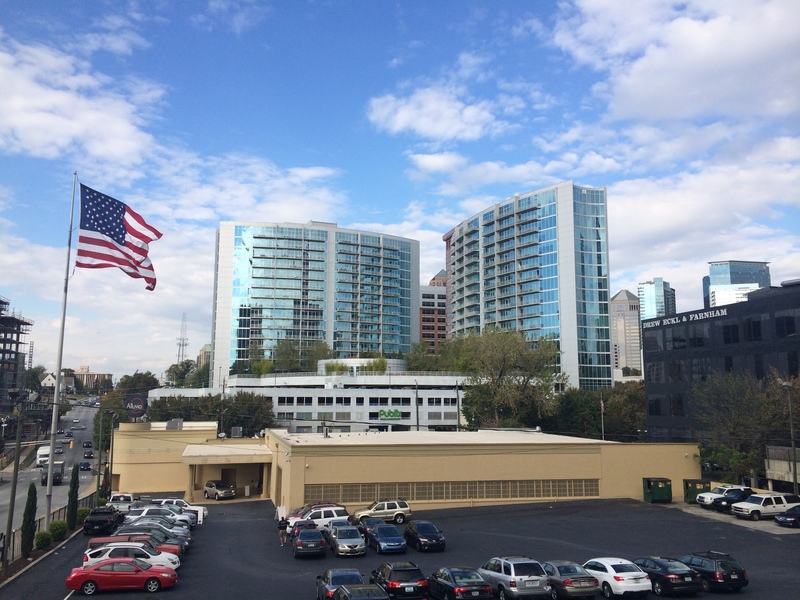 343 homes, or 51% of the Midtown Atlanta condo market sold for less than $300,000. 82 condos sold for less than $200,000 or about 12 percent of the total sales. 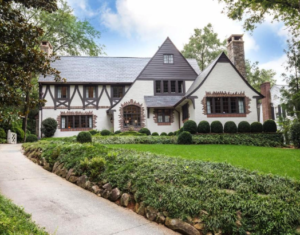 What’s The Real Estate Market Like In Midtown Atlanta? Midtown Atlanta’s real estate market is still moving strong in 2019. However, we are starting to see some homes remain on the market longer and not the past frenzy of offers (and sometimes multiple offers) within a day of going on the market. 2019 will also see the values moderate. This is a GOOD THING, AND NOT A SIGN OF ANY TROUBLE! A real estate market cannot continue at 6% or more appreciation each year. If that were to happen, Midtown Atlanta, or ANY area of Atlanta could quickly become unaffordable to many people. So we look forward to continued price and value appreciation, but just not as dramatic as we have seen in the past few years. If you are looking to Buy or Sell a home in Midtown Atlanta, MyMidtownMojo.com can help! Selling? Do you want to sell your Midtown Atlanta single family home or condominium? Call us today at 770.713.1505 to schedule a free market analysis of your home. Or, complete our Seller Information Form and we will be in touch with you! Buying? Are you looking to buy a Midtown Atlanta home, condo or townhome? We can set up specific searches for you based on price, community or other specifics you may be looking for. In a competitive Seller’s Market, we can alert you of new listings within minutes of them hitting the market! Just complete out Buyer Information Form, or let’s schedule a time to talk about what you are looking for! 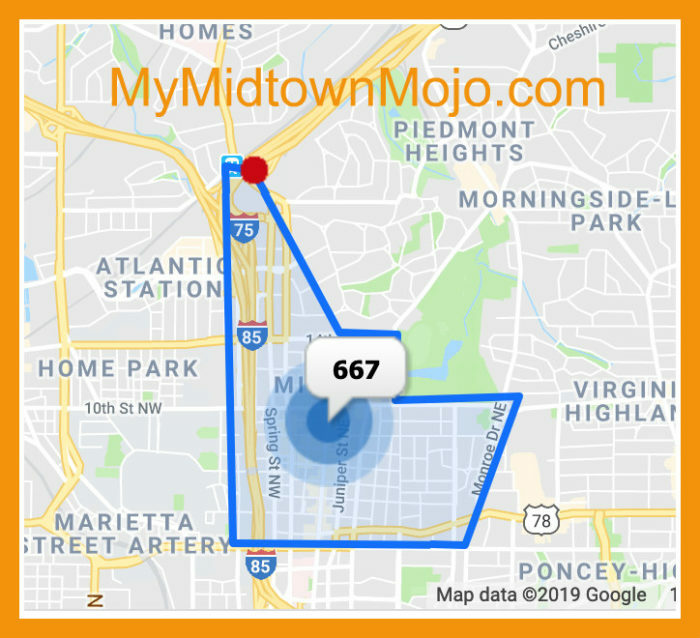 Contact MyMidtownMojo and Thomas Ramon [email protected] House Properties at 770.713.1505 or [email protected] for all your Midtown Atlanta real estate needs! The Buckhead area of Atlanta is usually associated with the “mega-mansions” of places like Tuxedo Park or West Paces Ferry Road, where you find the Governor’s Mansion. For the purpose of this overall Buckhead 2018 Year End Real Estate Market Report, we will just focus on the primary zip code of 30305. Yes, there are parts of 30309, also referred to as Brookwood that could be considered Buckhead as well. But this “snapshot” will give you an idea of the home sales in 2018. You can find more information about Buckhead here. Disclaimer: As we do this “15,000 ft overview” of the Buckhead market, there are certainly other homes/neighborhoods that could qualify to be part of Buckhead. But these numbers are from FMLS and Zip Code 30305. We had to break down the single family homes into three categories, just like we did with our Brookhaven, GA Real Estate Market Report. So we will look at homes sold over $1m, homes sold $500,000 – $999,000 and finally homes sold for less than $500,000. Over $1 Million — There were 104 homes sold, ranging from a high of $4.975M in Tuxedo Park to $1M in Haynes Manor on Peachtree Battle Avenue. $500,000 – $999,000 — This price range had the highest number of home sales, at 160 homes sold. 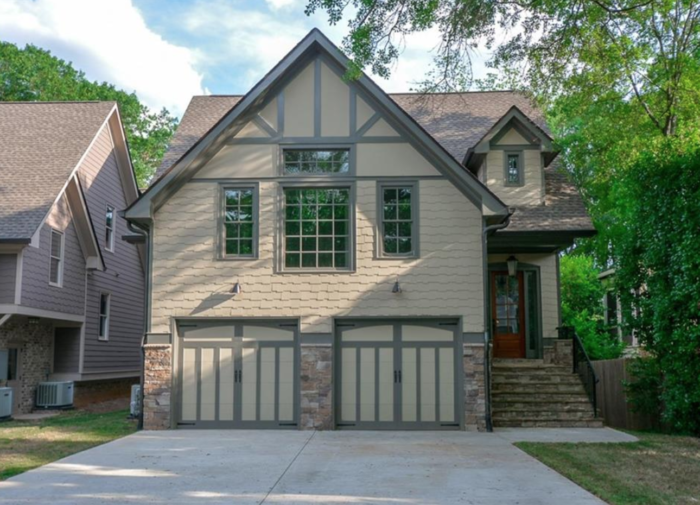 They ranged from a high of $985,000 in Peachtree Park to $500,000 in Peachtree Hills. $500,000 or less — As you might expect for Buckhead, there were not many homes sales less than $500,000! Lucky Number 13 to be exact…ranging from a high of $490,000 to a low of $429,900 in Peachtree Hills. 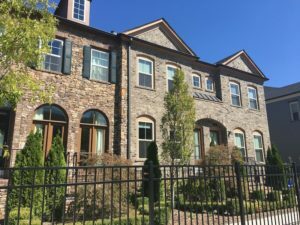 Buckhead, as we mentioned earlier, is known for the mega-mansions along West Paces Ferry, as well as being home to Lenox Mall, Phipps Plaza, the former Ritz Carlton Buckhead and the Buckhead Atlanta shopping area on Pharr Road. Buckhead is also known for its pricey condominiums and townhomes! There were 471 sales in 2018, ranging from $3,700,000 at The St. Regis down to a low of $81,000 at Slaton Manor. How’s THAT for a price range of homes….Wow! Of those 471, an amazing number of 365 homes sold under $500,000. What’s The Real Estate Market Like In Buckhead? Buckhead is somewhat of a unique part of the real estate landscape of Atlanta. It’s the place where the mansions are….the shopping and some pretty awesome restaurants. The area is seeing its share of new apartment buildings (think Icon Buckhead next to the Waldorf-Astoria) and upcoming changes to Phipps Plaza as they add a hotel and other amenities. The fact that there were 365 condo sales under $500,000, and there were many that were in the $200-300,000 range make it still affordable for many. If you are looking to Buy or Sell a home in Buckhead, MyMidtownMojo.com can help! Selling? Do you want to sell your Buckhead single family home or condominium? Call us today at 770.713.1505 to schedule a free market analysis of your home. Or, complete our Seller Information Form and we will be in touch with you! Buying? Are you looking to buy a Buckhead home, condo or townhome? We can set up specific searches for you based on price, community or other specifics you may be looking for. In a competitive Seller’s Market, we can alert you of new listings within minutes of them hitting the market! Just complete out Buyer Information Form, or let’s schedule a time to talk about what you are looking for! Contact MyMidtownMojo and Thomas Ramon [email protected] House Properties at 770.713.1505 or [email protected] for all your Buckhead real estate needs! 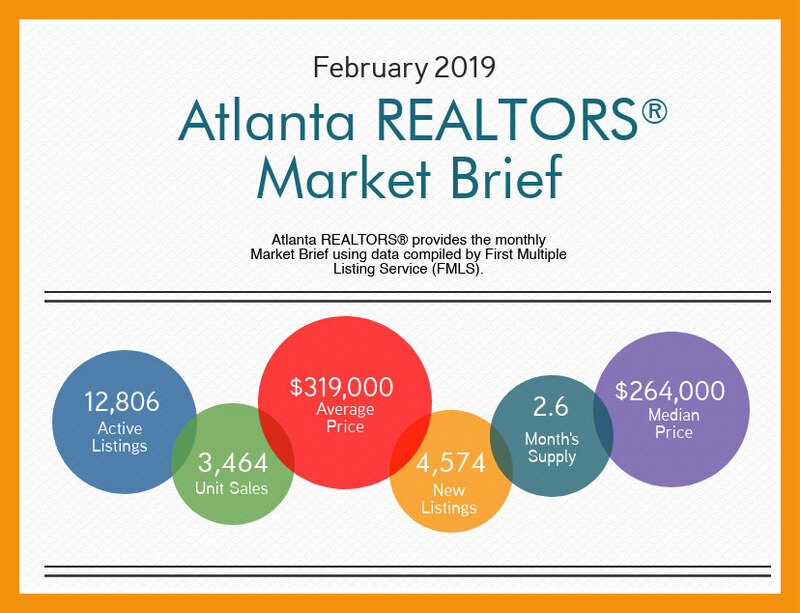 The Atlanta REALTORS® Association has released their Atlanta Real Estate Market Brief — February 2019. Overall residential sales were at 3,464 which is a decrease of 7.4% from the previous year. When you look at price (both average and median) you see they continue to gain traction and are ahead of 2018 numbers. 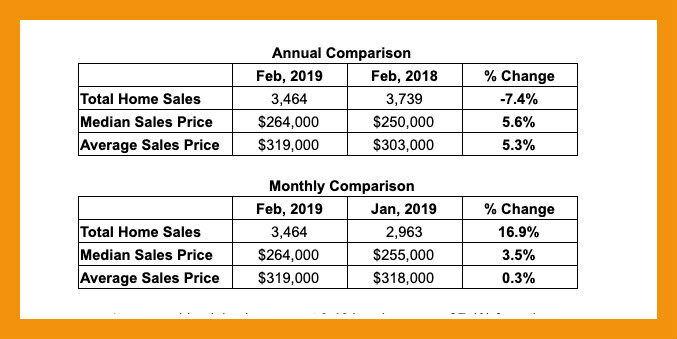 The median sales price in February was $264,000, an increase of 5.6% from February, 2018. The average Sales Price was up by 5.3% to $319,000. What’s The Atlanta Inventory Like? Inventory increased by 15.7% from February, 2018 with 12,806 active listings. (Remember those MetroBrokers digital signs back in the day that had 80,000, 90,000 and even 100,000 homes For Sale? Shreeeeek!) New listings were up by 15.4% from February, 2018. The month’s supply over a 12-month period decreased to 2.6 months. Is This A Normal Real Estate Market? A normal real estate market has 6 months of inventory. Less than 6 months (as indicated above) is a Seller’s market, and more than 6 months is a Buyer’s market. More inventory means buyers can probably get the Seller to negotiate more on price or other concessions. In a Seller’s market, we find homes selling for list price, and even above list price. My word of caution in a report as broad as this…..real estate is all about location, location, location. These average sales numbers are just that… an average and what you may see in your neighborhood, city or specific condominium building may vastly differ from these numbers. This is why it’s always best to get a real estate professional to give you a market picture for your home and neighborhood/building. If you have questions about the value of your home, give us a call, or just fill out the form below and we will be in touch with you! Just Checking You're For Real! Awesome! We have your home Under Contract, and moving day is just around the corner! SHREEK!!!!! You need a Moving Check List to get it all in order! What do I do with all this stuff? How are we going to move it all? Change of address cards? 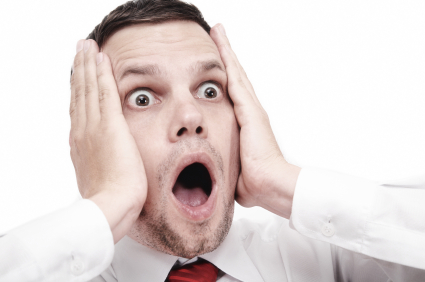 ALL of these things come into play, and quite frankly, it can be a bit overwhelming! I’ve moved some 17 times in my life, and 5 of those were corporate relocations, and the rest were “do-it-yourself” moves, be they between apartments or even cities. And while I have not moved in many years, I can still remember the stress like it happened yesterday. It’s a big deal selling your home, and it’s no small matter to prepare to move. At Palmer House Properties and MyMidtownMojo, we know that moving takes time and energy, but there are ways to make it go as smoothly as possible. Here are some tips as you anticipate and prepare for your move. Keep in mind, if you are doing a corporate relocation, the actual packing may not be a worry as the moving company will do that for you! I know what that is like…and it’s sweet! Sell or give anything away you won’t move. Maybe plan a garage sale, or donate items to charity. Call several movers for estimates. Gather and store dental, medical and pet’s veterinary records. Start alerting friends and companies that mail to you. Contact children’s school and have transcripts forwarded to new school. Go online and complete a change of address with the USPS. For tax purposes (if you qualify for moving deductions), keep a record of all moving expenses and keep receipts of any items you donate to charity. Arrange for disconnection of utilities and re-connection at new location. Make sure you return items you’ve borrowed from library and friends. Arrange the cancellation of newspaper and other home deliveries. Ask bank to release safe deposit box and transfer account to new bank. Drain gas from your lawn mower, and properly dispose of flammable items and other materials that should not be put in the trash. Arrange to have your phone disconnected. Transfer your homeowners insurance so you will be covered at your new home. Pack a suitcase you can live out of, if necessary, for the first few days at your new home. Empty and defrost refrigerator and freezer and let them air dry for a day. Deodorize large appliances with baking soda or coffee. Remember to leave the keys (and remote controls, such as for the garage) to your old property with your real estate agent. Label your most important boxes, so you know what to open first. Make sure mover is properly informed of your new address. Make sure you have payment ready before van is unloaded at new address. Confirm arrival date and time. Before you leave, check every room, closets and the attic a final time. Check locks on doors and windows. Hopefully this list will help you get through all the details and stress of moving! 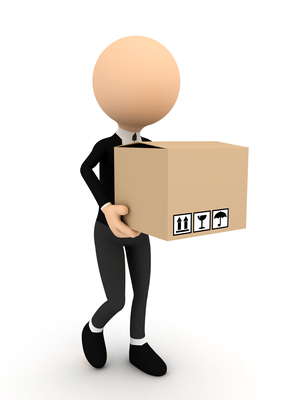 Please know, we are here to help you with any of the “moving parts” (no pun intended!) and get you to your new home, or out of the home we helped sell for you! Brookhaven, GA has always been a desirable location to live, ever since I’ve live in Atlanta! And when it became a city, I think that desirability grew even more as they looked to make things better like zoning and parks. In this post, we want to focus on the 2018 real estate year in Brookhaven and what the real estate market was like. You can find more information about Brookhaven here. Disclaimer: As we do this “15,000 ft overview” of the Brookhaven market, please keep in mind many factors come into play as we pull market numbers. Some homes listed as Brookhaven, are not actually IN the city limits of Brookhaven. 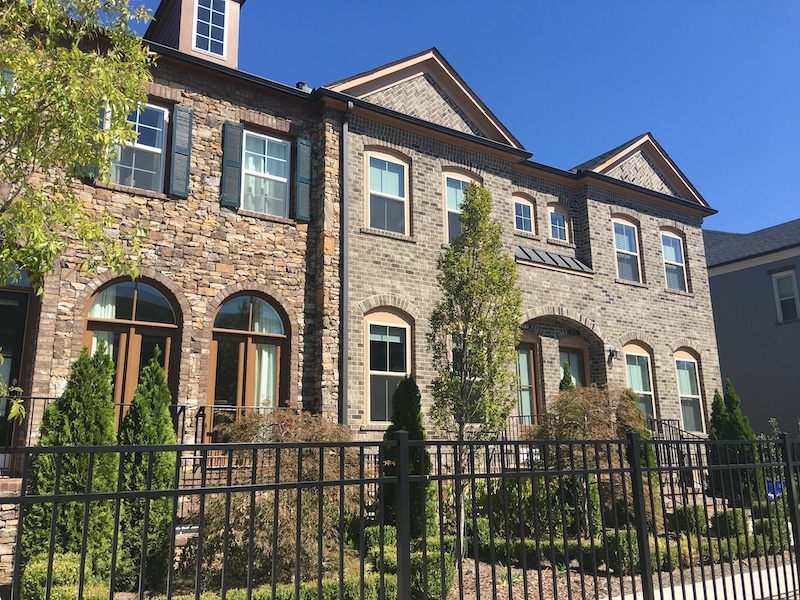 Ashford Park is a prime example…parts of it are actually in Chamblee, so some homes will get listed in Chamblee and some get listed in Brookhaven. But this overview will give you a good idea of what’s happening in the Brookhaven area. Over $1 Million — There were 49 sales in 2018, ranging from several at $1M to a high of $2,600,000 for 2799 Mabry Road. $500,000 or less — And there was an impressive 169 homes sold in this price range, from a low of $215,000 to a high of $495,000. There is a good chance than many of these homes in the lower price range were torn down to make way for the higher priced new construction that Brookhaven is seeing. On some streets in Brookhaven, we would not be surprised if in a few years there will be no original homes left…having all been torn down and replaced with new construction. It’s pretty amazing. Brookhaven has a MARTA station on Peachtree Road, and another, just outside its city limits with the Medical Center station on the North side. Town Brookhaven has been the city’s “downtown” of sorts, and now a new development, including a hotel has been proposed right in front of Town Brookhaven,. Brookhaven has a variety of condominium and townhome communities. Surprisingly enough, there were like 60-some sales of condominium homes that were in the range of $205,000 or less….making Brookhaven still an affordable location for first time buyers. We do expect, however, to see those prices continue to rise in the coming years as the city works on making changes to areas like Buford Highway where any new construction will be way above these kinds of prices. In 2018, there 380 sales, ranging in price from $106,000 at Keys Lake Condominiums (off Buford Highway) to a very impressive $1,350,000 for a home at The Aldredge. In looking at the report, you can see a majority of the sales were in the $400-600,000 range. What’s The Real Estate Market Like in Brookhaven? As we said earlier in this report….the housing boom of “tear-down and build new” will most likely continue into the future. We suspect it won’t be long any many streets will no longer have any of the older homes left…all having been torn down and replaced with the much larger $1m+ homes! Townhomes and condominiums are still affordable in many areas of Brookhaven, but land prices and new construction will surely change that. There are numerous large, older apartment complexes that are more than likely going to get bought up and torn down to make way for new construction. It’s a challenge the city is looking to deal with to include affordable housing requirements for new construction. How that all plays out remains to be seen. If you are looking to Buy or Sell a home in Brookhaven, MyMidtownMojo.com can help! Selling? Do you want to sell your Brookhaven single family home or condominium? Call us today at 770.713.1505 to schedule a free market analysis of your home. Or, complete our Seller Information Form and we will be in touch with you! Buying? Are you looking to buy a Brookhaven home, condo or townhome? We can set up specific searches for you based on price, community or other specifics you may be looking for. In a competitive Seller’s Market, we can alert you of new listings within minutes of them hitting the market! Just complete out Buyer Information Form, or let’s schedule a time to talk about what you are looking for! Contact MyMidtownMojo and Thomas Ramon [email protected] House Properties at 770.713.1505 or [email protected] for all your Brookhaven real estate needs!